Digital Cyclone, the developer of My-Cast Weather and My-Cast OneLook for the iPhone, seems to have designed the two closely-related weather apps with good design in the forefront—and some way to justify a price differential not too far in the background. Both of the apps are good, unremarkable but for one nice design touch, described later in this review. Like many weather offerings for the iPhone, each automatically provides the current conditions and forecast for your current location, while enabling you to search for and bookmark additional locations. The information is standard—hourly and daily forecasts (going out five hours in OneLook, 23 hours in Weather, and six days in both versions), and radar in motion (the primary difference between the two being that the you can scroll and zoom the map in Weather, but not in OneLook). 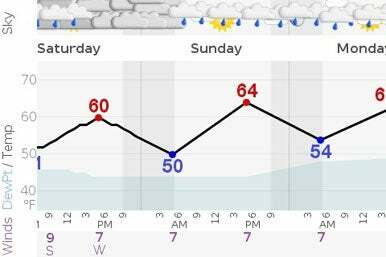 The Bottom Line: When you rotate your screen to landscape view, My-Cast Weather presents a four-day forecast line graph that displays both warming and cooling trends and daily highs and lows. The other informational difference is that severe weather alerts are available in Weather, but not in OneLook. This doesn’t make a lot of sense, as it seems that severe weather alerts, which are provided by the National Weather Service, should be included even in free weather apps, but perhaps Digital Cyclone sees it as a “feature” that can help justify Weather’s higher price. The most significant difference between the two, besides the weather maps is that Weather’s interface is cleaner, both easier to read and easier to navigate. Different features are available via icons on the bottom of Weather’s screen, and to get to some of these features in OneLook you may need to navigate backward or forward. In addition, when you rotate Weather’s screen to view the daily or hourly forecast in landscape mode, you can view a very nice line graph—similar to one that’s a default view in OneLook, but easier to view and with more detail, because you can’t view OneLook’s forecast line graph in portrait mode. Slimmed Down: My-Cast OneLook’s forecast screen offers fewer options than the pricier My-Cast Weather—most notably no severe weather alerts. But the line graph, though compressed in portrait mode, works well. Both apps had a few bugs, as well—occasionally displaying blank screens, or leaving the line out of the line graph. The bugs seemed sporadic, and quitting and relaunching the apps usually eradicated them. Nothing terrible, but considering the scores of weather apps available for free or similar prices, it’s something to consider when making a purchasing decision. On a more positive note, the line graph forecasts are surprisingly effective in conveying upcoming weather trends—especially the ones you can view in My-Cast Weather’s landscape mode. This, in addition to My-Cast Weather’s interface, which is far superior to OneLook’s, make the pricier version worth considering, depending on your weather app tastes. 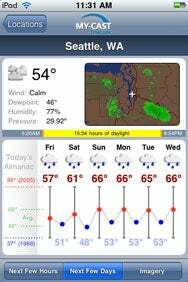 OneLook has an adequate feature set and decent interface, but doesn’t quite measure up to some of the best free weather apps, and many of the weather apps that share its $1 price tag.